Amir Khan will fight against former world champion Julio Diaz at the Motorpoint Arena in Sheffield on April 27th. It will be his first fight in Britain for over two years. Amir Khan’s record is 27-3 (19 KOs). However, Khan lost his WBA and IBF light-welterweight titles after defeats against Danny Garcia and Lamont Peterson and is currently in a rebuilding process and on a quest to return to the world title. The Bolton boxer had his last fight in December when he bounced back after his two defeats and completely outclassed Carlos Molina in Los Angeles. Julio Diaz is a former two-time lightweight world champion with a record of 40-7-1 (29 KO wins) without proving himself against elite opposition, but is confident of causing a shock against Khan. He said: “There are a lot of weaknesses. He can’t take a punch and when he gets overwhelmed he tends to panic too much. I aim to make it a brawl. I won’t be too technical or too pretty but it will be a real fight.” However, he last held a world title in 2007 and has lost four and drawn one of his last 11 encounters. It will be a great fight since Amir Khan is motivated to challenge Danny Garcia for the title again. 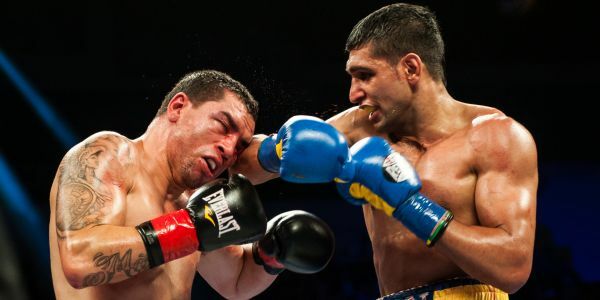 After Khan’s victory against Molina, he said: ” I’m ready for Danny Garcia anywhere, any time, any place. He was lucky. He caught me with a good shot.” Boxing fans should be excited about the fight!